Last may, on a walk by the cliffs with some friends, I sampled the best chocolate brownies ever at the charming Salmarsh café in Seven sisters country park, Sussex. 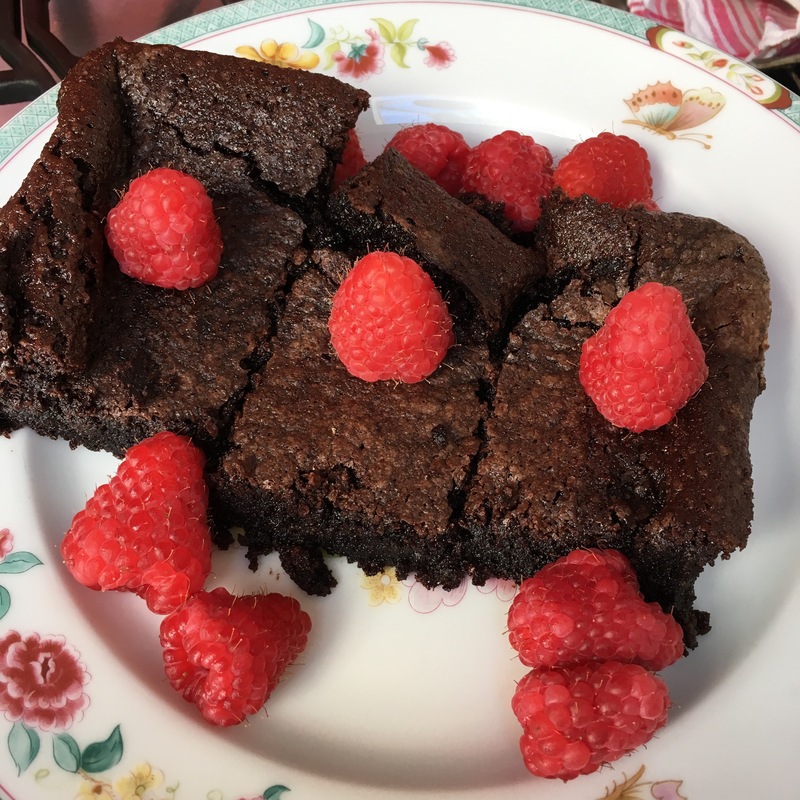 This recipe, inspired by Nigella Lawson, is the closest I can get to the Saltmarsh brownies – that is until I go back to enjoy them! 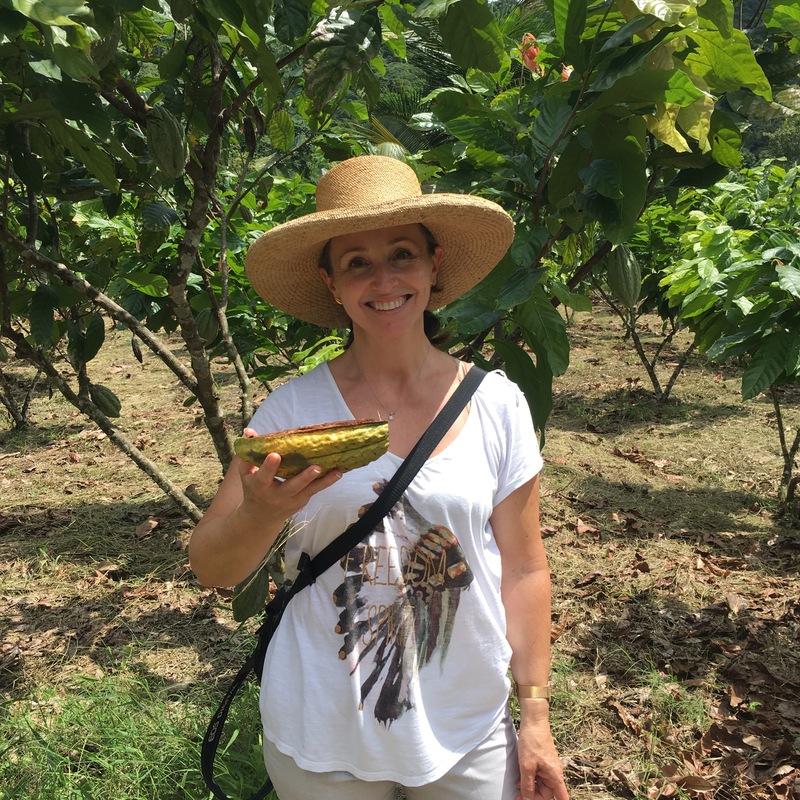 This month, I have travelled to a land of cacao and volcanoes, of high rain forest and dry Pàramo heath, of hot springs and salty ocean waves, and I wanted to celebrate the beautiful, godly taste of chocolate with this very delicious recipe which unites the best cacao from South America with the best olive oil and almond from Europe. A nice one to take on holiday wherever you are heading! Preheat your oven to 170°C. Grease a 22 or 23 cm/ 9inch tin with a little oil and line the base with baking parchment. 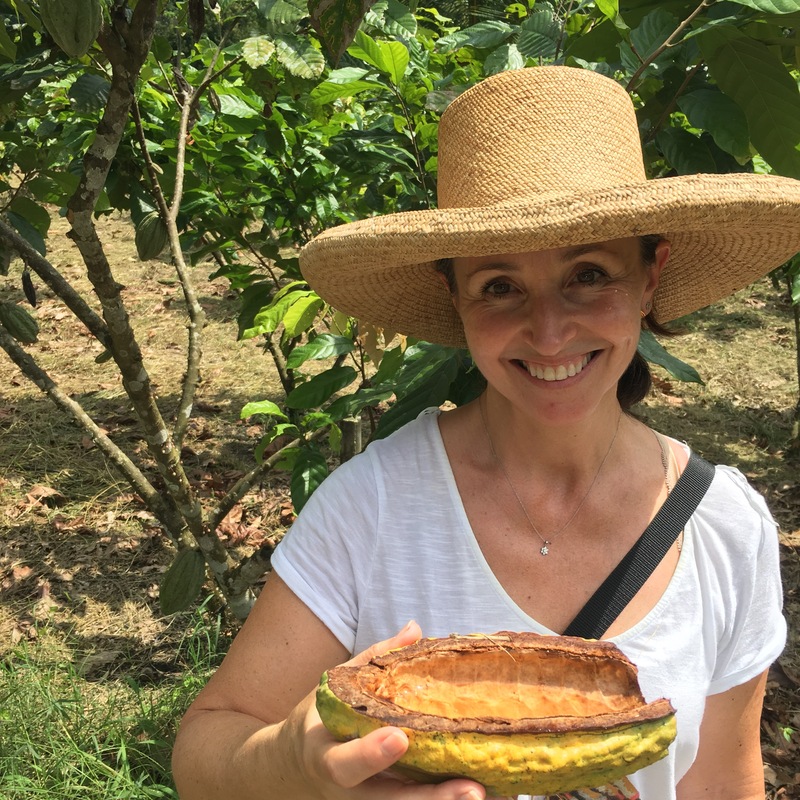 Measure and sift the cocoa powder into a bowl or jug and whisk in the boiling water until you have a smooth, dark, fragrant paste. Whisk in the vanilla extract, then set aside to cool a little. In another bowl, combine the ground almonds (or flour) with the bicarbonate of soda and pinch of salt. Put the sugar, olive oil and eggs into the bowl of a mixer with the paddle attachment and beat together vigorously for about 3 minutes until you have a pale-yellow, aerated and thickened cream, a lot like a mayo. Turn the speed down a little and pour in the cocoa mixture, beating as you go, and add the ground almond (or flour) mixture. When it is all well mixed in, pour this dark, liquid batter into the prepared tin. Bake for 40-45 minutes or until the sides are set and the very centre, on top, still looks slightly damp. A cake tester should come up mainly clean but with a few sticky chocolate crumbs clinging to it. Let it cool for 10 minutes on a wire rack. Eat with ice cream. PS: Have tweaked the original to include less sugar and oil and more almond but see what you like! I used mint from the wonderful herb garden that comes with the villa we are staying in here in Crete and I would encourage you to grow a pot of mint wherever you can as it is such an uplifting smell and it grows really fast in pots, on windowsills or balconies in pretty much any climate. Blitz all ingredients in a food processor (I use a standing blender); adding a bit of olive oil or even water too make it lighter if the consistency is too thick. But I never puree it to finely as I enjoy a bit of texture. Beetroot is great for joints and particularly important for runners or anybody who wishes to take care of their knees. I love it also for its happy colour ! My Spanish born great grand-mother on my maternal side had a wonderful family recipe for “Ajo Blanco”, or so I am told because alas nobody recorded it and therefore nobody can recall its details… So, to complete my family recipe archives, I can only try to recreate this recipe with voices others than hers… Why does it seem so important to me to do so? Because Ajo Blanco is a bit of an iconic Andalucian soup and because it happens to be at the same time a very healthy and rejuvenating combination of almond meal and garlic. Popular and traditional cuisine often combine the qualities of being at once tasty and healthy and this very ancient recipe proves the point with its elegant simplicity. This is a Thermomix adapted recipe but any good blender will do. Mix the garlic, salt and almonds for 30 sec at speed 5. Add the chopped bread (no crust) and mix another 15 sec. You should get a sort of thick paste. Keep at speed 5 and add the olive oil, followed by the vinegar and the water. Mix for 1 min at speed 7 to 8. Season with a little salt and serve cold with the chopped cucumber or grapes to decorate and give a nice biting texture. I like to serve this in glasses decorated with a mini skewer with fresh grapes and to sprinkle a few flaked almonds and some fried toast on top. Parque Maria Louisa – I had a beautiful morning run there, but you can take a horse carriage to it if you are no runner! Los Jardines del Real Alcazar – The beautiful gardens of the moors kings… A treasure! Gardens of Casa de Pilatos – see pictures above.